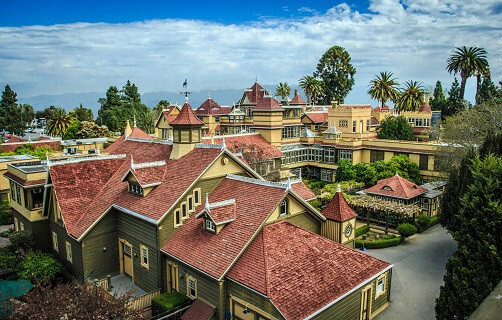 The Winchester Mystery House in San Jose is one of the most unique attractions on American soil. Beautiful yet bizarre and built with the fortune of the Winchester Repeating Arms Company, its story has inspired numerous horror writers, including Stephen King. Over 24,000 square feet with 160 rooms, 110 of them available to tour, naturally visitors are going to be treated to some unusual and fantastic curiosities. The Winchester Mystery House is considered one of the most haunted homes in America, which is no surprise given the unusual story behind its creation. According to legend, after enduring much personal tragedy, Sarah Winchester consulted a Boston medium, who told her she was being haunted by the angry spirits of those killed by the Winchester rifles. The medium told her to go west and build a house for the spirits to stay in, and so long as she never stopped building, she would live eternally. While some may not believe in ghosts, there is certainly something spooky about the mansion. Towards the center of the labyrinthine domicile is the Séance room, where it is said Mrs. Winchester would go to consult the spirits on what to build next. Many of the tour guides have their own tales to tell about odd noises and how they avoid the corridors of the third floor after dark. Harry Houdini himself once came to the house after Mrs. Winchester’s death to dispel the stories of ghosts, but failed. The mansion is undeniably a labyrinth filled with confounding elements, like staircases that go into the ceiling, windows indoors, doors that open into walls, dead ends, and skylights emerging from the floor. The most dramatic feature, though, might be the Doorway to Nowhere. Located on the second floor, what looks like an ordinary door actually leads to a two-story drop into the garden. It is believed that the winding corridors and trick features were designed to confuse unwanted spirits. Another way Mrs. Winchester confused the spirits was with secret passages. The Séance Room only has one way in, but three ways out, one of them disguised as a closet, and another becomes a sudden drop into the kitchen sink below. These were so she could leave the room after consulting the spirits for inspiration without them following her. Mrs. Winchester was remarkably rich, with an inheritance of $20million ($507,172,414 in today’s dollars), 50% ownership of the Winchester company, and an income of $1,000 per day ($25,359 today). This allowed her to spare no expense in designing and decorating the house to make it inviting to friendly spirits to keep the angry ones at bay. The opulence can be seen everywhere. There’s a Grand Ballroom made with expensive woods like mahogany, teak, and rosewood. She was also a collector of artisan windows, as shown in the $25,000 Room. Filled with stained-glass and crystal windows that she collected over her lifetime, they’re estimated to be worth millions now. In fact, there’s even a custom-made, stained-glass window made by Tiffany. One of the features about the house that leads many people to believe Sarah Winchester thought herself pursued by spirits was the frequent use of spider web motifs and the number thirteen. In the aforementioned Tiffany window, there are thirteen blue and amber stones in a spiderweb pattern. 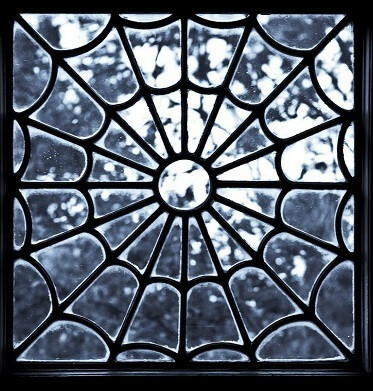 The fireplace grates throughout the mansion also have a spiderweb pattern, as do numerous other windows and décor. The number thirteen comes up all throughout the mansion. There are thirteen bathrooms, windows would have thirteen panes, chandeliers hold thirteen candles, and so much more. In fact, the house even offers special flashlight tours every Friday the 13th, honoring Mrs. Winchester by tolling the bell in the tower thirteen times on the thirteenth hour of the day. 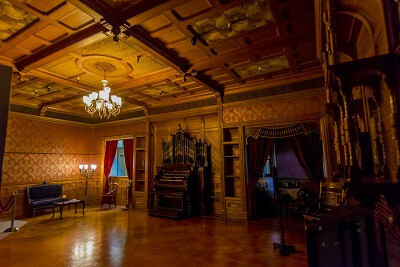 Though the mansion gives excellent daily tours year-round, for a truly spectacular experience, one should come during the Halloween season for the annual Hallowe’en Candlelight Tour. The already chilling and Gothic atmosphere of the mansion is enhanced when illuminated solely by candlelight, and the sense of otherworldly presence could make even a skeptic second-guess themselves. 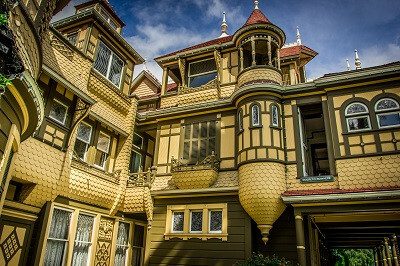 Guests are even encouraged to wear costumes, making the Winchester Mystery House the ultimate Halloween event.